When you’re looking for a new job, your potential salary is only part of the story of what life will be like. That great new paycheck may not be so great after all if it barely pays for a roof over your head. We want you to learn more about a great place to live near Birmingham where your paycheck goes a long way. Trulia teamed up with the jobs site Indeed to take a closer look at the U.S. cities with the highest salaries, once you adjust for cost of living. It turns out that the cities at the top of the list are not the big metropolises you may expect. They discovered several mid-sized cities with a low cost of living are places where you can have a good job, a good life, and a good home even if you make a heck of a lot less than a Wall Street or Silicon Valley paycheck. As a headstart for people looking to relocate for a job, we looked into what the big opportunities are in four of these cities and dug into Trulia’s data to find out which neighborhood or suburb in each gets the most searches by locals—in other words, by the people who know the area best. If you’re up for relocating, consider Trulia a sweet spot for starting your home search. The three largest employers in town are the University of Alabama at Birmingham (UAB)(23,000 employees), Regions Financial Corp. (7,100), and Honda (4,800). Mercedes-Benz U.S., U.S. Steel, and Wells Fargo are also major employers. Birmingham locals search Trulia for homes in the 35210 zip code, which includes the suburb of Irondale. More than other local B’ham zip codes, Irondale is the #1 place where a decent paycheck goes a long way. Affordability may be one reason: Median home prices here are $147,000, well below the metro area’s $195,000 median and not even half of Atlanta’s median of $300,000. 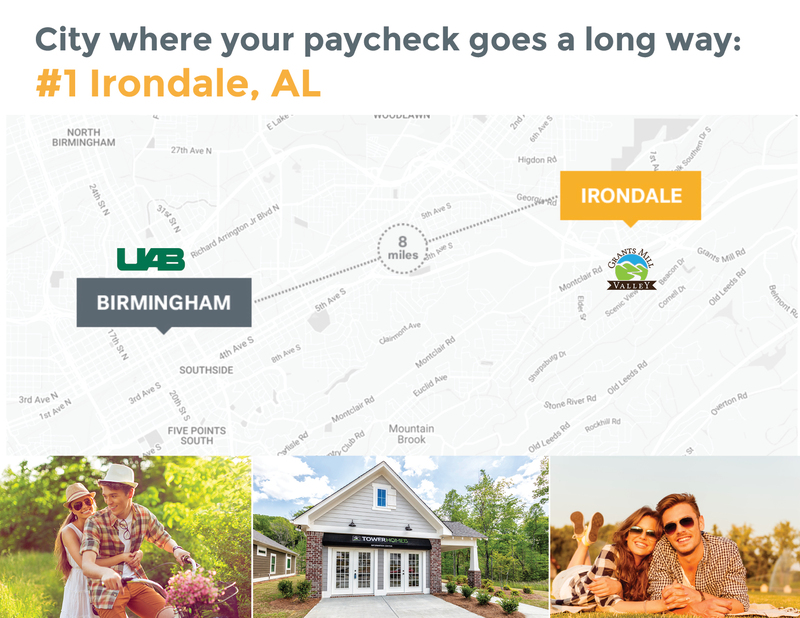 The average rent in Irondale is $1,249 a month.